Do you ever feel like you cannot get enough of running? Try running 3,096 miles over the course of 52 days. That is what running (ultrarunning) legend Marhsall Ulrich did at age 57. He recounts the experience in his book "Running On Empty". 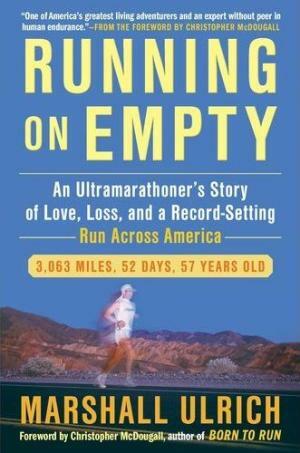 "Running on Empty" is a pretty good read. He gives you a solid look into his life; from losing his first wife to cancer to crying about not being able to find socks, Marshall shares quite a bit with us. 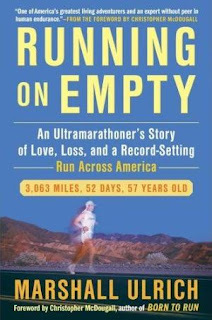 For me, these details about his life, vignettes of other running feats and the intense training regimen for this "transcon" are the best parts of the book. As you might guess, most of the book recounts the epic journey across the country but after reaching Utah (more or less) it starts to sound somewhat repetitive. If you're a runner (especially a longer distance runner) you know what it's like to be out there, on the road, feeling the ups and downs with no end in sight. The book finishes strong with and an emotional run through New York City. He made it.... it is truly an epic journey. Alas, there's more! One of the great features of this book are the stats, training regimen and other details of the journey in list form (more or less) at the end of the book. Enjoy!